The following instructions will guide you through making folders and repositories on your local computer (Desktop, Documents; Dropbox; Google Drive; etc.) available inside virtualized applications running inside the VMware Horizon (Virtual Software) client in macOS. This documentation assumes you are already logged in to Lehigh's virtual software server. If you need help logging in please review these stepwise instructions. 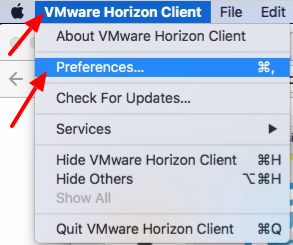 When you are connected to view.cc.lehigh.edu, click the VMware Horizon Client menu from the top menu bar to the right of the Apple menu. Select Preferences. 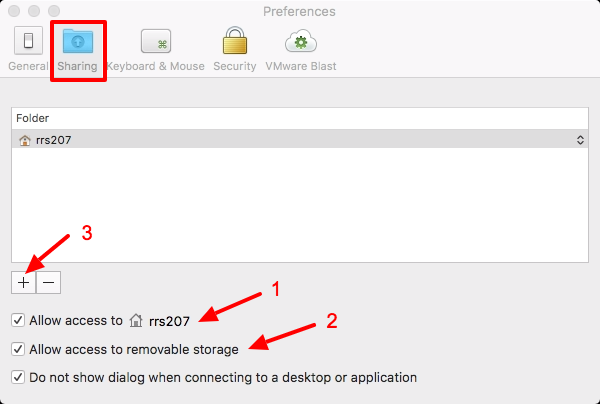 This will bring up the preferences section of the VMware Horizon Client. When sharing settings appear, you have a few options to choose from. You can select any or all of these. Share your local files <yourusername>: This option will share all the folders within your macOS user folder including Desktop, Documents, Downloads, etc. as well as any cloud locations you use including Dropbox, Google Drive, OneDrive, or iCloud. Allow access to removable storage: This will share any connected devices such as USB flash drives or external hard drives currently connected to your computer. Add button: This button will allow you to browse for and select a specific folder on your computer that you want to share. When you are satisfied with your configuration, simply close the preferences window using the familiar red "X" icon at the top-left of the window. When you go to save a file in an application running within the virtual environment, the familiar file browser window will appear where you can navigate to the location where you want to save your file. In the left pane of that window, locate This PC and if it isn't already, click to expand it as shown. 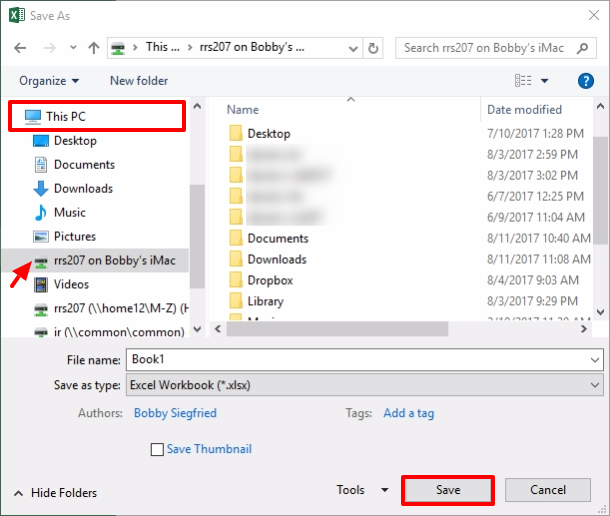 Any of the folders/locations you have chosen to share will show up as<folder_or_location_name> on <your_computer_name>. Select the folder/location you want to save to. Folders within the location you select will show up in the right pane of the window. In the case of the example, the macOS user folder/location is selected and the folders that show up in the right pane include the familiar Desktop, Documents, Downloads, Dropbox, etc. folders. Once you have selected your save location, click Save as you normally would. Your file has now been saved to a location you can easily access on your local computer.